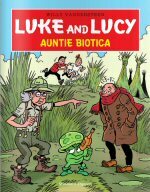 Luke and Lucy (aka Suske and Wiske) are very popular in the Netherlands and Belgium. Therefore it might not be surprising that around 200 stories appeared in over 50 years. Everyday an episode of a story appears in the papers. A full story then appears in a book which has a red cover, and the first print of it consists of four hundred thousands copies. Since Suske and Wiske are not widely known outside of the lower countries, certainly not in comparison with say Tintin, a comprehensive introduction might be necessary, and some are available. A short introduction in French and Italian is also available. The most important characters in the adventures of Suske and Wiske (In Dutch). The popularity in the Netherlands and Belgium is enormous. A poll was held to see which stories are the most popular. The results of the poll show that stories from the so called Blue Series are very well liked, but stories from the regular Red Series are also present at the top of the list. The explaining text and the titles in the list are only in Dutch. Suske and Wiske were created by Willy Vandersteen, who also created many other comic characters. Almost every of his comic series was taken over by assistants. He did this to have time to create new series. Suske and Wiske were taken over by Paul Geerts. He writes and draws the new stories. For some years now he is assisted by Marc Verhaegen. The three authors, mentioned above have there hands full with the creative part of the stories. They are assisted by a lot of people. These people are responsible for e.g. colouring as well as putting the text in the balloons. Willy Vandersteen had his own Studio Vandersteen for this. In the 1980's responsibility for the studio was taken over by the publisher. their contributions to the Suske and Wiske adventures. Here are some overviews of book titles which were published since the first one in 1945. In 1993 the weekly magazine Kuifje (Tintin) ceased publication. The Dutch languages editions were succeeded by a new magazine Suske en Wiske weekblad. Suske and Wiske weekblad was published for ten years from 1993 until 2003. Suske and Wiske magazine is not the only prepublisher of Suske and Wiske stories. So are some newspapers. There is no complete overview of which stories were published in these papers, but we do have a small incomplete start. In the fifty years of there existence Suske and Wiske have tried a foreign career a lot of times. Nowadays every book (album) is available in French (see above). The original names were changed since most of them were to Flemish. In 1945 the first episodes of the first story of Suske and Wiske appeared in the newspaper De Nieuwe Gids. The adventures of Suske and Wiske were preceded by the adventures of Rikki and Wiske. However Rikki has gone bye-bye. A short historical introduction, can be found above. In 1994 the Royal Youth Theatre in Antwerp started a Suske and Wiske musical De stralende sterren (the shining stars). A year later this musical was performed all around the Netherlands. The musical was just a new step in a long tradition starting with comic films featuring Suske and Wiske (in the fifties and nineties), as well as the Puppet Theatre of Pats (fifties and sixties) and on television by Wies Andersen (1974). The successors of the musical featured the same actors. In a Belgian television program (1996) a retired Lambik, played by the musical actor, looked back on the history of Suske and Wiske. All actors had there voices taped for a performance in the Amsterdam Planetarium, located in the Artis Zoo. A later performance was the Suske en Wiske op visite-show. In 2002 a new musical started in Antwerp. : De spokenjagers. This page contains only a relative small amount of data about Spike and Suzy. Much more information can be found on the Dutch version of this site.